The Serious Sam franchise is known for being pure unadulterated action overload, with hordes of enemies, buckets of viscera, and unrelenting violence saturating every nook and cranny of the series. 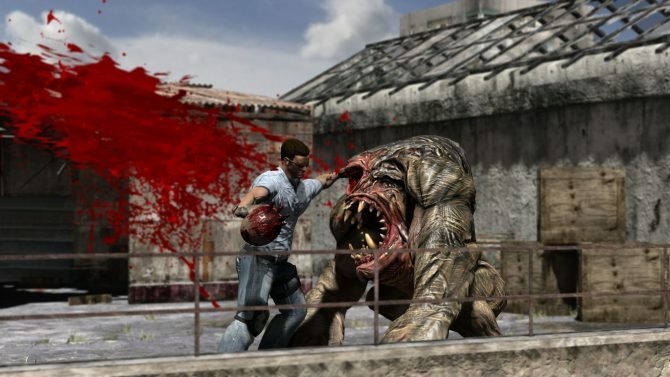 Now, with Serious Sam 3: BFE right around the corner, developer Croteam and publisher Devolver Digital have given several indie studios the opportunity to capture the signature Serious Sam spirit by creating games of their own using the IP. 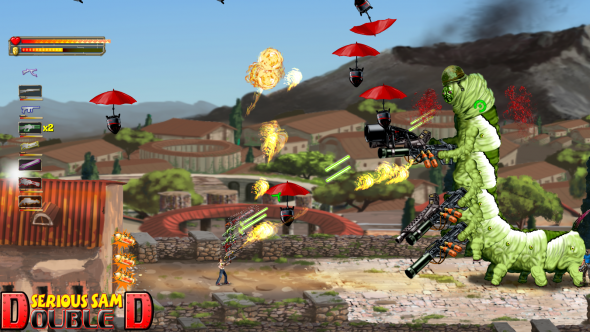 The first one to be released is Mommy’s Best Games’ Serious Sam: Double D, a 2D action side-scroller that boasts bizarre enemies, and an absolutely ridiculous gimmick called the Gunstacker. 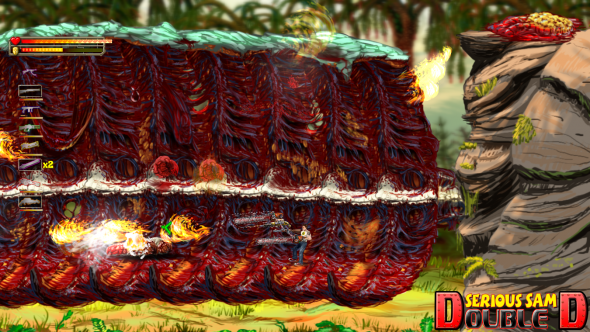 Does it, uh, stack (hurr durr) up to the original series, and do Serious Sam proud? 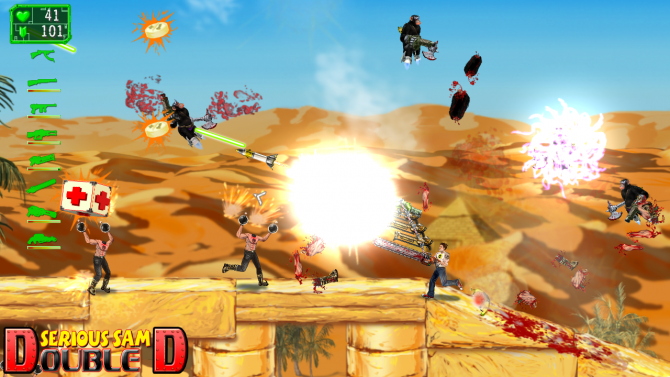 Double D manages to take everything that is awesome about Serious Sam and turn it into one of the most satisfying action experiences of the year. Forget the plot; it’s a nonsensical hodge-podge of enemies that all, for one reason or another, want to kill Sam. What it lacks in narrative, it makes up for in humor and charm; there’s absolutely nothing serious about any of the enemies, and they make it a point to tell you that. If anything, it’s an off-the-wall, kooky means to the end, and by the “end” I mean “killing ridiculous enemies in all manner of ways”. And when I say ridiculous enemies, I mean ridiculous enemies. You’ll find some signature Serious Sam enemies in the mix, such as the ol’ reliable Headless Kamikaze hordes, but the real spotlight is on the ones that Mommy’s Best have very likely concocted while on a vast variation of illegal substances. One of the first new enemies you’ll encounter are psychotic cyber-monkeys whose feet have been replaced by jets, and whose hands have been replaced with a chrome battleaxe and a banana gun, which shoots explosive bananas at you. And I don’t think I’ll ever come across a character more bizarre than the Vuvuzelator, which is literally a stack of pancakes on legs, with vuvuzelas sticking out of it. These constant moments of WTF make getting bored during Double D almost impossible. But that probably has the most to do with the action as well. In standard Serious Sam fashion, the action is relentless, chaotic, and sometimes even overwhelming, and as such, it’s bloody awesome. Double D, at its best, plays like Contra, Metal Slug, and any other 2D action shooters that require fast reflexes and constant attention. Just fifteen minutes into the game I was dealing with hordes of enemies of all shapes and sizes, and it was glorious. At its worst, well, I can’t say, because Double D runs on all cylinders from the get-go, to the point where you’ll have to take a breather because you won’t be able to keep up with the action. Mommy’s Best considered this as well and implemented a one-button quicksave function, at any place and any time. So if you’re in the middle of a fight and it’s too much sensory overload, you can hit the quicksave button, close the game, and take a nap before you get right back into the mix. It doesn’t hurt the difficulty of the game, nor does it interrupt the flow; it’s extremely smart, especially for a balls-to-the-wall action game like Double D.
The Gunstacker mechanic that Mommy’s Best has introduced ramps all the action and carnage to 11, and turns an otherwise solid action game into one of the best I’ve played this year. 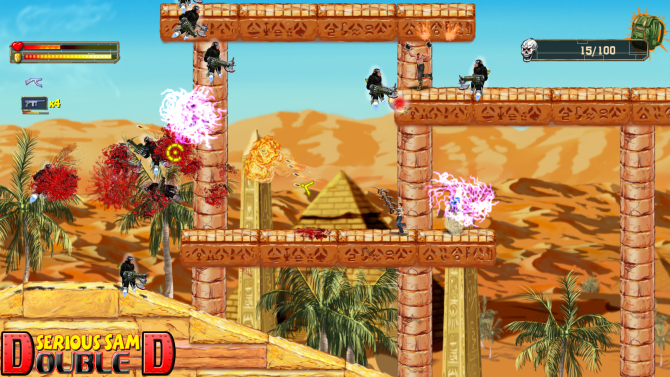 In a nutshell, throughout the game you’ll come across Gunstacker connectors, allowing you to attach multiple guns to each other, creating absolutely crazy combinations of weapons. Not only will you find additional connectors, but you’ll also find up to four multiples of each of the eight guns in your arsenal. 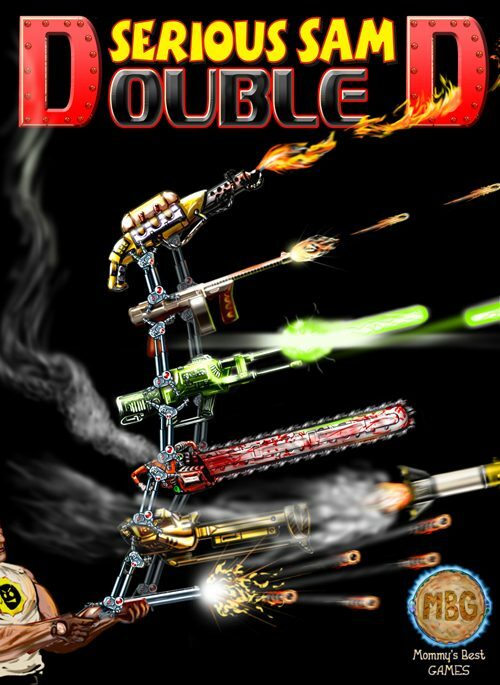 So if you want four laser guns attached to a chainsaw? Done. 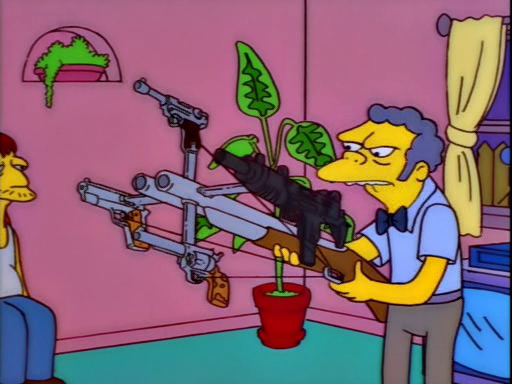 Two Tommy guns attached to two rocket launchers attached to a shotgun? Easy. You want both? That’s perfectly fine; there’s eight slots for eight separate death weapon combos. The combinations can easily get out of hand, and aide in making huge firefights as much about brain as brawn. Do I use my laser gun-chainsaw-rocket launcher, or my shotgun-flamethrower-shotgun-grenade launcher? Or maybe I should just go bats*** crazy and rush in with four chainsaws? These are the important questions you ask yourself when faced with a horde of space monkeys, cyborg dinosaurs, and Headless Kamikaze, and it is nothing but smile-inducing. At about three hours, the campaign is fairly short, but the replay value is very apparent. There’s a decent amount of hidden secrets to be found, such as more connectors and weapons, along with little cameos and various pop culture references. The very first secret area references a certain sandworm from a very revered sci-fi book series; it’s short and completely unnecessary, but little nods like these truly make finding secret areas worth doing. Additionally, multiple playthroughs of the campaign are rewarded with various unlockables that may make the next playthrough easier/more rife with violence, and hey, can’t say no to more guts and gore in a Serious Sam game. Across the way you’ll also find unlockable challenge levels, which definitely live up to their name. While initially doable, they end up becoming unforgivingly tough, to the point where you’re incredulous of your own crappiness, and want to keep on playing. I’ve only gone through about three of them, and they all definitely made me quite sweaty in the crotchal area, thanks to their suddenly-ramped-up toughness. 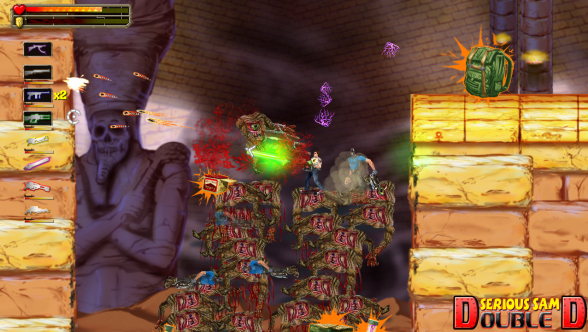 This review is already long-winded, so I’ll have to summarize it like this: Serious Sam: Double D might be a small indie game inspired from a previous IP, but it’s also the most fun I’ve had with a game this summer, and perhaps even the year. Usually I throw review games by the wayside once I’m done with them, but I’ve been playing Double D consistently for the whole week, and don’t plan on stopping until I can 100% the game. 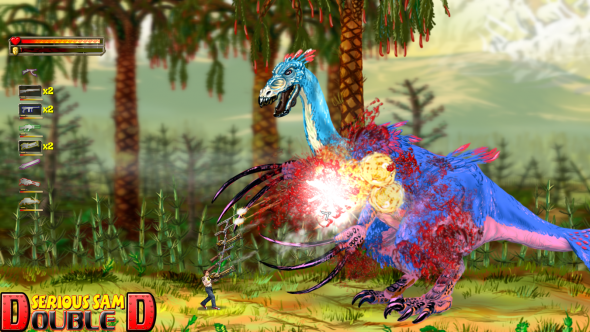 It perfectly embodies the spirit of Serious Sam and 2D action games, and has the variety, difficulty, and replayability to easily put it over the hump of mediocrity. Best of all, it succeeds 100% in creating hype for Serious Sam 3: BFE; if that wasn’t already my most anticipated FPS of the year, it would be now. A must-have, and at $7.99, it’s inexcusable to not have it in your library.